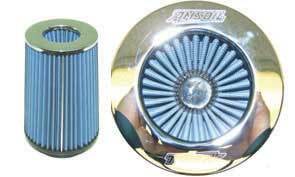 Long before coming to work at AMSOIL, I owned an Oldsmobile Cutlass Ciera that refused to start on below-zero mornings. I blamed it first on the battery and then on the car itself. “It must be a lemon,” I reasoned. Turns out it was probably the dirt-cheap conventional motor oil I used in those days. Unfortunately, there was no friendly AMSOIL Dealer in my neighborhood to teach me that conventional oils contain paraffins (wax) that can thicken in the cold enough to prevent the crankshaft from turning fast enough to start the car. 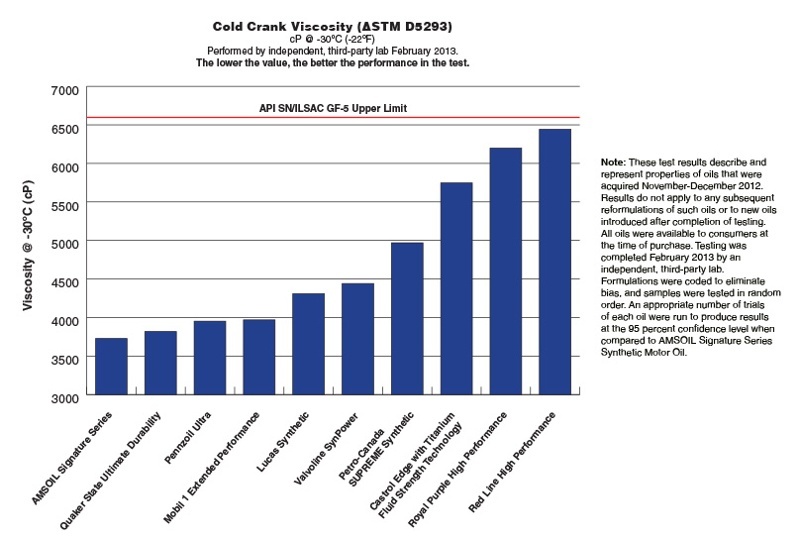 The Cold Crank Simulator (CCS) Viscosity Test is one method of testing a lubricant’s cold-flow properties. The test is used to determine the internal fluid friction in motor oils with a “W” grade designation. It measures the amount of energy required to overcome the resistance present in a lubricant that has been collected at temperatures from 23°F (-5° C) to as low as -31°F (-35°C), depending upon the anticipated SAE “W” classification of the oil being tested. The CCS Viscosity Test simulates an engine’s ability to turn over at cold temperatures. Gauges monitor rotations per minute, amperage draw and motor input. A universal motor is run at a constant voltage to drive a rotor, which is closely fitted inside a stator and immersed in the test oil. 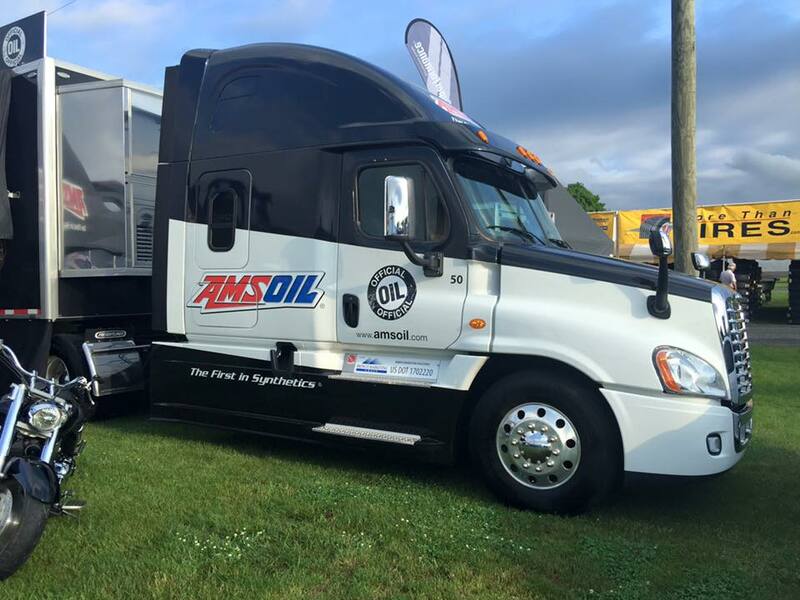 The viscosity of the oil at the given test temperature determines the speed of the rotor and amperage draw; thicker oil results in slower speed and more amperage drawn. Speed and amperage drawn are then converted to centipoise (cP). CCS results showing a lower cP number indicate lower viscosity. Oils that are thicker at low temperatures (high cP number) tend to exhibit more resistance and require more energy to pump and circulate and display a higher cP number on the CSS test. A higher cP number at a given temperature is directly correlated to a greater amount of energy required to turn an engine over, and it also indicates a greater potential for starting difficulties. Most importantly, CCS results suggest a lubricant’s ability to be circulated at a given temperature and its ability to provide wear protection. As seen in the graph, AMSOIL Signature Series 5W-30 Synthetic Motor Oil outperformed several leading synthetic motor oils in a CCS test. 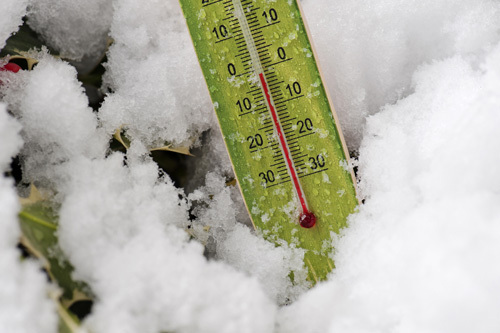 Extreme cold can cause conventional motor oil, transmission fluid and gear lube to thicken, starving vital moving parts of necessary lubrication. In many cases, thick motor oil will prevent vehicles from starting. Cold, thick transmission fluid results in delayed or sluggish shifts and inadequate protection for bearings, valves and other critical parts. Thick gear lube, meanwhile, requires more energy to turn the gears, reducing fuel efficiency. Because gears and bearings in the axle housing are splash-lubricated, conventional gear lubes that are too thick at cold temperatures can starve internal components of lubrication, which can cause excessive wear and premature failure. 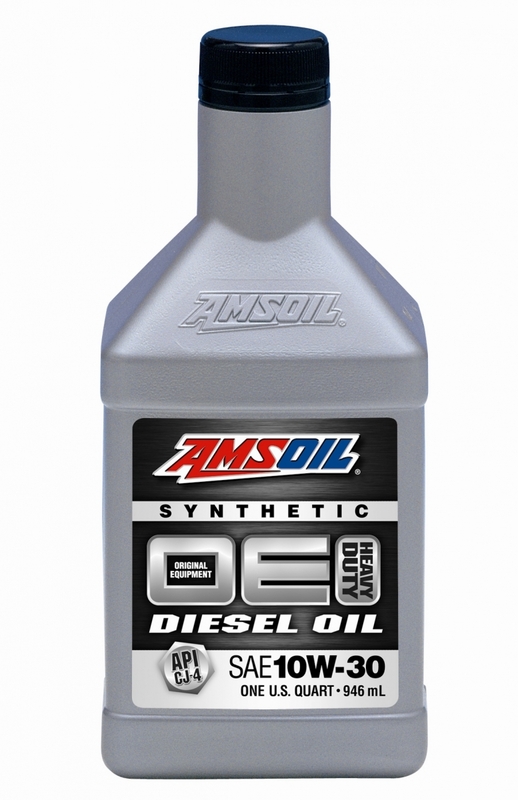 AMSOIL synthetic lubricants (http://oilordering.com/products/) do not contain paraffins, so they remain fluid in sub-zero temperatures. 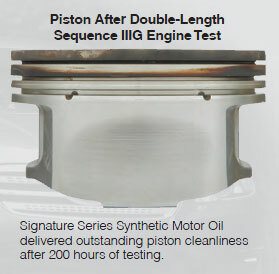 Watch the video to see what happens when AMSOIL Signature Series Synthetic Motor Oil (http://syntheticwarehouse.net/home/featured-products/signature-series-5w-30-synthetic-motor-oil) and a conventional oil are cooled to -40º. While the conventional oil fails to flow from the beaker, Signature Series remains fluid and delivers 36% easier and faster cold starts*. 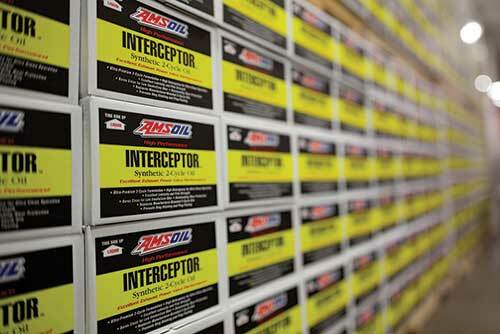 This means it can reach vital components faster, providing more immediate engine protection and reduced wear.